Chemical binders in the sand can produce gas when heated by the molten metal and if not vented adequately, the gas may flow into the metal resulting in a gas porosity defect. This is most likely with cores that form thin interior features of castings that heat up quickly and have long venting paths. 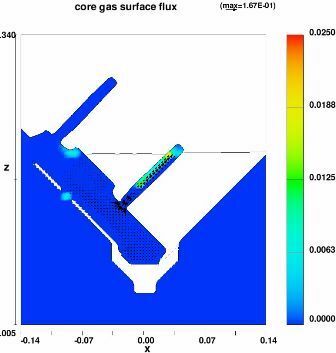 FLOW-3D‘s core gas model predicts the possibility of such gas defects and helps design core venting that can safely evacuate all the binder product gas from the cores. The Core Gas model predicts defects for resin-bonded cores both in iron castings (Fig. 1) and in aluminum castings (Fig. 2). 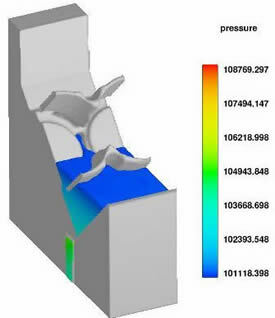 It works concurrently with filling and solidification models and computes binder gas generation and flow during and after the casting filling. Figure 2b: The water jacket core when unvented blows gas into the metal during fill (Fig. 2b).